Stations 56 and 26 were dispatched to a MVC overturned with entrapment on Cottontail Lane near Weston Canal Road. Rescue 56 and E261 Arrived on the scene to find a 2 vehicle MVC involving a delivery truck and a single passinger vehicle. Upon the arrival of the first fire units it was determined by medical personnel on the scene that the driver of the passinger vehicle was pronounced at the scene. 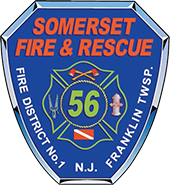 Car 56, Car 562, SO 56 and E562 were returning from a SCUBA drill out of town and responded to the scene.